There has been much talk lately about the correction or restoration of human body deformities with the help of Autologous Fat Grafting. “Autologous Fat” is the type of fat which derives from the human organism. Liposuction is a special treatment that allows fat to be removed from a human body area and then to be transferred to another one. First things first, we should make clear that Fat Grafting refers to Autologous Fat Grafting, i.e. FROM A DONOR AREA TO A RECEIVING AREA OF THE SAME PERSON. Under present conditions, Heterologous Fat Grafting, i.e. Fat Grafting from one person to another, is impossible to be performed due to non-antigenic tissue compatibility. What are the characteristics of the adipose tissue? Is fat an undesirable tissue or maybe not? Adipocytes are placed close to one another and are found subcutaneously or centrally. Their structural material is responsible for the shape and curvature of torso. One of the basic functions of adipocytes is the storage of food calories. Namely, food energy is transformed into fatty acids, which are stored in the cytoplasm of adipocytes. Fatty acids are the quintessential energy molecules. The breakdown of these molecules releases energy, required for the metabolic needs of the organism. The adipose tissue is “thermal insulating” and does not permit wide temperature variations between the external and internal environment, which contribute to the organism’s thermoregulation. Recent studies have shown that the adipose tissue contains a large number of primary cells, the so-called stem cells. These cells play a major role in the regeneration of tissues. Stem cells are primitive cell forms, which are responsible for the production of all tissue cells. The morphology and properties of these amorphous – primary cells are modified by various hormonal effects and may play a primordial role in tissue regeneration. Which are the adipose tissue properties that we can take advantage of during the Fat Grafting procedure? It has been proved that the adipose tissue is a human body tissue, which can be treated in a relatively easy and safe way. It is a tissue with partial blood flow. However, the adipose cells are easily perfused via diapedesis of the surrounding area tissues. This means that the better the blood flow in the area that we want to perform Fat Grafting, the better thereceiving and hence the viability of the transplanted adipose tissue is. It is a tissue rich in stem cells, which are multifunctional, primary cells with powerful regenerating and rejuvenating properties. Which are the stages of Fat Grafting procedure? First, the implant – adipose tissue is extracted from a body area with excess fat, the so-called donor area. The extracted fat is found in the form of micro molecules, like micro-droplets and not in large chunks. The fat which has been extracted through liposuction is placed (after a specialpreparation) into “Liposuction cannulas” and then applied to the area to be treated, the so-called RECEIVING area. Which body parts are usually used as DONORS during the Fat Grafting Treatment? What happens to the transplanted fat during the Fat Grafting treatment? As already mentioned above, the adipose tissue is partially perfused. This is the reason why fat is considered to be a sensitive “material” and should be carefully treated when in transfer. After we have completed the Liposuction procedure and have collected the adipocytes, we follow a specific isolation procedure of healthy cells in order to achieve their maximum viability after their transfer. The Blood flow of the receiving area. Generally speaking, after the Fat Grafting treatment about 50 – 70 % of the transplanted fat is absorbed and dissolved into the body in approximately 2 – 3 months. This means that the remaining fat percentage in the receiving area is about 30 – 50% of the transplanted fat. The absorption of transplanted fat is considered to be a problem in order to accurately predict the results of Fat Grafting treatment. Today, we try to provide a solution to this problem overcorrecting the concerned area, i.e. transplanting more fat from what would be required. Usually, the amount of transplanted fat is higher, i.e. 2 or 3 times greater than the desirable, so that the remaining fat will provide the expected result. In most cases, except for overcorrection, more than one Fat Grafting sessions may also be required in order to achieve a good and safe result. In which cases can we perform Fat Grafting? When do we usually perform Fat Grafting in Reconstructive Surgery? Congenital disorders, i.e. skeletal anomalies which are recognizable at birth. How can Fat Grafting treatment provide a solution to tissue defects after injuries, burn injuries or oncologic surgery? One of the most revolutionary applications of Fat Grafting technique is that we can take advantage of the excess and undesirable fat and use in Reconstructive Surgery. In injuries with deformed scars, we can inject fat just under the scar. It has been proved that the stem cells, which are found in abundance in the adipose tissue, considerably improve the scar composition through new collagen production. In burn injuries, the autologous fat injection right under the burnt surface is innovative since it provides impressive results in skin composition and texture. Fat Grafting treatment is considered to be one of the most modern and safe restoration methods in cases such as oncologic surgery, congenital disorders or after skin and soft tissue injuries, where there is a large amount of tissue defect and asymmetry. Other significant cases are breast reconstruction after mastectomy, breast hypoplasia treatment or the congenital disorder treatment of the body and torso (e.g. Poland Syndrome, Parry Romberg Syndrome etc.). When do we usually perform Fat Grafting in Aesthetic Surgery? When do we perform facial Fat Grafting? Fat Grafting can be performed in different facial areas either autonomously or in combination with Face Lifting. The autonomous Fat Grafting means that the fat is transplanted in special facial areas, without performing any other surgical treatment. On the other hand, Face Lifting combines the modern Plastic Surgery techniques, other than the “Lift”, i.e. surgical correction of tissue loosening. The adipose tissue transfer gives us the capability to correct volume deficits and local tissue atrophies. With the Face Lift treatment, we can correct the loosening of skin and underlying tissues, whereas by Fat Grafting not only can we correct hollows and atrophies, but also regenerate facial tissues due to the high concentration of stem cells found in the transplanted adipose tissue. In which areas do we perform facial Fat Grafting? What kind of anesthesia is administered during facial Fat Grafting? The facial Fat Grafting treatment is performed under local anesthesia or combined with neuroleptanalgesia (intoxication). However, when the Fat Grafting treatment is combined with face lifting, then the patient is subjected to general anesthesia. What is the procedure followed during facial Fat Grafting? When we perform facial Fat Grafting, we always intervene in TWO main AREAS: the DONOR area and the RECEIVING area. The DONOR areas that we usually use are the belly, inner and outer thigh surface, since we do not need a large amount of fat. 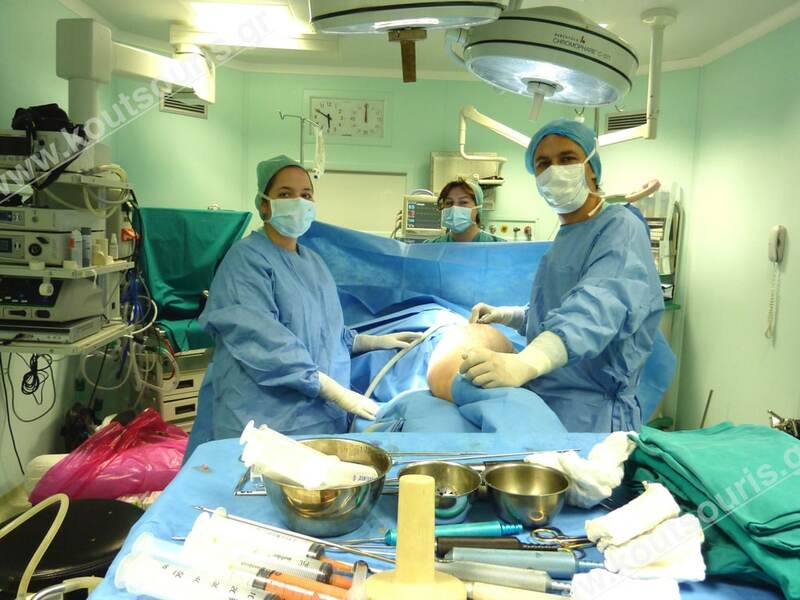 First, we anesthetize the donor area and then we perform SAFELIPO liposuction (see 3D – SAFELIPO liposuction). We extract a sufficient amount of fat, taking always into consideration the image improvement of the donor area. The extracted fat is centrifuged under aseptic conditions, so that a large number of stem cells and structural adipocytes can be isolated and collected. After that, the extracted fat is transferred in the RECEIVING area. The receiving face areas concern atrophies, hollows in the nasomalar grooves, cheekbones, cheeks, hollow temples as well as the area under the eyes. Given that the fat acts like a structural material in the areas where it is placed, the result of Fat Grafting treatment concerns not only the restoration of facial volumes, but also the regeneration of facial skin and tissues, due to the transplantation of stem cells along with adipocytes in the receiving area. Does the facial Fat Grafting treatment hurt? How will I look like after the surgery? When it comes to Fat Grafting treatment, we could say that it is an almost painless procedure, given the fact that it is performed either with the combination of local anesthesia and intoxication or local and general anesthesia. When it comes to the postoperative period, most patients describe a feeling of pressure or mild annoyance, since the area forms an immediate postoperative edema, which can be more intense in some cases. In order to control post-surgical sensitivity or pain, anti-inflammatories and painkillers are administered to the patient. Swelling and bruises are the most common characteristics of a postoperative image in the transplanted area, i.e. under the eyelids, cheekbones, cheeks and jaw. Swelling and bruises are more intense in the first 5 -7 days, while at the end of the first two weeks the cyan color under the eyes or the nasomalar grooves gradually disappears and is replaced by a light-yellow color (due to the absorption of micro hematomas). The swelling goes down to the jaw (because of the gravity) and it gradually disappears in the following days or weeks. The patient is able to go outside after the 7th – 10th day under certain restrictions, such as wearing black sunglasses, while after the 3rd week the surgery scars can be easily covered using makeup. Right after surgery, the patient can leave the clinic and go home under some instructions. The patient should remain laid down for about 24 hours, having placed 2-3 pillows under his head so that the head is at a higher level than the rest of the body in order to avoid any edema. In order to reduce the swelling, we should apply frozen compresses to the eyes infused with cold chamomile, in order to avoid swelling. The switch of cold compresses should begin immediately post surgically and be continued for at least 10-12 hours afterwards. For the first two to three days after surgery, incisions should be taken care, being kept clean and sterile. Immediately after surgery and for the next 12-14 days the patient should avoid bending and any strenuous activity (including activities that increase blood pressure, such as weight lifting or sports) in order to prevent the formation of hematomas etc. Most patients (depending on the extent of the treatment) can go back to work after 2 or 3 weeks after the treatment. Regarding the sutures removal from the small incisions in the donor and receiving area, there is no need to be removed, as they fall on their own usually after 12 -15 days. Are there any side effects after the facial Fat Grafting treatment? The restoration of tissue atrophies or facial deformities using the autologous Fat Grafting technique is a demanding surgical treatment with special technical details and difficulties. It requires experience, excellent knowledge of the anatomy and the particularities of the facial features of each person, in order to achieve a perfect aesthetic and functional result. Because of the very sensitive nature of the tissues in the facial area, the most frequent consequence after blepharoplasty is contusions (bruises) and edema (swelling), which both gradually disappear within 2-3 weeks. Hematoma, inflammation or any infection of the DONOR or RECEIVING area are also rare complications, which are treated with drainage and antibiotic care respectively. Α nervous strain injury may cause numbness or paralysis in a facial area. However, these side effects rarely appear. If a larger amount of fat will be absorbed than the desirable, then we should repeat the treatment again and add fat in the atrophic area. If a smaller amount of fat will be absorbed in the facial area, than the desirable, then it will be more than enough and it will create a swelling deformity like a small sausage. In such case, we should repeat the treatment, in order to remove the transplanted fat, either by liposuction or direct excising. A very catastrophic complication, which can occur during the facial Fat Grafting treatment, is the vascular embolization, i.e. the accidental injection of the transplanted fat into the cavity of a large vessel in the facial area. This fact may cause ischemic skin necrosis. The most common skin area of ischemic necrosis after Fat Grafting is nose and forehead. The same mechanism, i.e. the endovascular fat embolism, may also cause the vascular embolism of the ophthalmic artery, which has as consequence the blindness of the patient after the Fat Grafting treatment.In 2015, 95 incidents of blindness were reported after facial injectable treatment. These complications mentioned above are very detrimental. This means that this kind of treatments is not a simple case and we should be very careful when we intervene in the human body. In which cases is breast Fat Grafting appropriate? Correction of the breast shape or the reconstruction of the breast shape and size after surgery due to oncologic diseases, inflammations or injury. Which women can undergo breast Fat Grafting? It is very important to clarify that the breast augmentation with Fat Grafting from our own organism is a treatment that requires the careful selection of patients as well as the good cooperation between the plastic surgeon and the patient. The patient that undergoes breast Fat Grafting should have a sufficient fat amount in her body, in order to extract the required fat amount for the performance of the treatment. Given that 50 – 70% of the transplanted fat is absorbed within 3 months after the surgery, we should transfer the double or triple fat amount than needed in each session in order to achieve the desired augmentation. It is clear that underweight or very thin women are excluded from this kind of treatment. On the other side, regarding the potential candidates for breast augmentation with Fat Grafting, we should note in the case of a woman with breast malignancy history in her family or one that underwent a relevant surgery, a thorough preoperative control should be done. The candidate may be excluded in case of negative findings. What kind of examinations should I do before the breast Fat Grafting treatment? Magnetic Resonance Imaging of breast (MRI). The primary goal of this thorough preoperative control is to examine the breast, where the breast Fat Grafting treatment will be performed. If we have a complete picture of the breast morphology before surgery, then we will be able to check any changes or to therapeutically intervene after the Fat Grafting treatment. What kind of anesthesia is administered during the breast Fat Grafting treatment? The breast Fat Grafting treatment is usually a long procedure with many technical particularities. The patient should stay calm and the surgeon should be very careful and methodical. On the one side, we should extract a large amount of fat from the donor area and on the other side; we should transplant this fat in many areas of the breast. This is the reason why general anesthesia is chosen. However, in cases of breast transfer treatments, which require a small amount of fat, e.g. after oncologic surgery, then the treatment can be performed only under local anesthesia or combined with neuroleptanalgesia (intoxication). When we perform breast Fat Grafting, it is required to transfer about 250 – 450cc of fat in each breast. As already mentioned above, after the Fat Grafting treatment about 50 – 70 % of the transplanted fat is absorbed and dissolved by the organism. Thus, the sufficient fat amount is about 150 – 300 cc per breast. Depending on the desired breast size that we want to achieve, we can repeat the breast (autologous) Fat Grafting treatment more than once. Usually, one to three or four consecutive fat grafting sessions are required within three months in order to achieve the breast size augmentation and correction with Fat Grafting. What is the technical procedure of breast Fat Grafting treatment? When we perform breast Fat Grafting, we put the fat deeply, close to the major thoracic muscle, as well as subcutaneously (about 1 to 1,5 cm under the skin). In general terms, we avoid putting fat directly into the mammary gland mass, in order to prevent any possible injuries and maintain – as much as possible – the clinical and mammographic image of the gland through the breast autologous Fat Grafting. Does the breast Fat Grafting treatment hurt? How am I going to look like after the surgery? When it comes to the Fat Grafting treatment, we could say that it is an almost painless procedure, given the fact that it is performed under general anesthesia. After the completion of the treatment, we inject a topical anesthetic with a long lifespan in the breast area, in order to avoid the postoperative pain. When it comes to the postoperative period, most patients describe a feeling of pressure or mild annoyance, since the area forms an immediate postoperative edema, which can be more intense in some cases. In order to control sensitivity or pain after surgery, anti-inflammatories and analgesics are administered to the patient. Swelling and bruises are more intense in the first 10 -15 days, while at the end of the first two weeks the cyan color gradually disappears and is replaced by a light-yellow color (due to the absorption of micro hematomas) disappearing in the following days. The patient usually stays at the clinic fortnight, in order to check and monitor her condition. Also, the patient should wear a tummy belt in the donor area and an elastic bra without metallic underwire. Immediately after surgery and for the next 12-14 days the patient should avoid bending and any strenuous activity (including activities that increase blood pressure, such as weight lifting or sports). Most patients (depending on the extent of the treatment) can go back to work after 7 -10 days after the treatment. Regarding the sutures removal from the small incisions in the donor and receiving area, there is no need to remove them because they fall on their own usually after 12 -15 days. Are there any side effects after the breast Fat Grafting treatment? 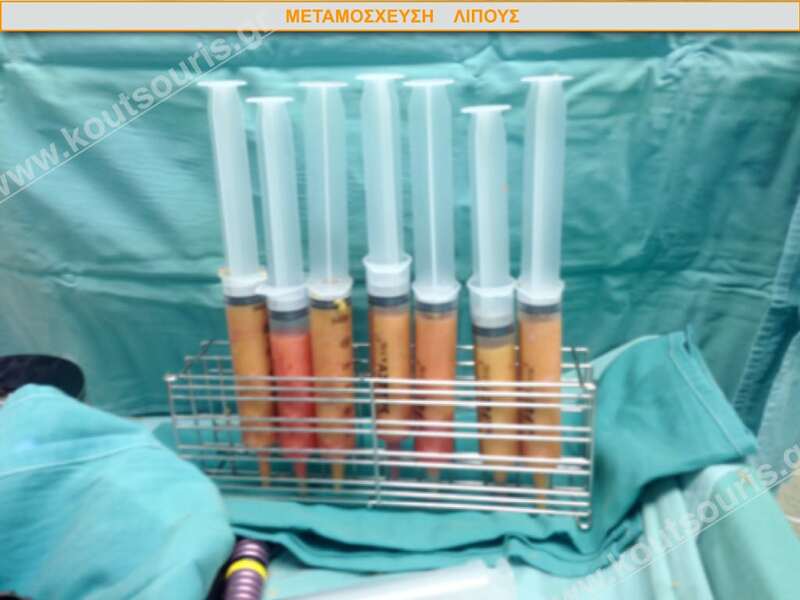 The restoration of anisomastia or breast size and atrophy using the autologous Fat Grafting technique is a demanding surgical treatment with special technical details and difficulties. However, it requires experience, good knowledge of the anatomy and the particularities of the facial features of each person, in order to achieve a perfect aesthetic and functional result. The most frequent consequence after breast transfer treatment is contusions (bruises) and edema (swelling), which both gradually disappear within 2-3 weeks. There is an often numbness feeling in the whole anterior chest wall area, which gradually disappears and is fully restored in about 1 -2 months. Usually Several months after the breast Fat Grafting treatment some fatty cysts may appear inside the mammary gland mass, due to fat melting, which look like a malignant transformation. In such a case, a surgical solution is required, as well as a thorough diagnosis, which is usually performed with diagnostic paracentesis. If a smaller amount of fat will be absorbed in the facial area, than the desirable, then it will be more than enough and it will create a swelling deformity like a small egg.In such case, we should repeat the treatment, in order to remove the transplanted fat, usually performing liposuction. Another complication, which can occur during the breast Fat Grafting treatment, is the injury of the mammary gland in different spots because of using micro cannulas during the Fat Grafting procedure. This fact may affect both the clinic and mammographic image of the mammary gland. Usually, after years, some microcalcifications can be created throughout the mammary gland, due to the appearance of micro hematomas. A differential diagnosis is required in order to prevent the breast malignancy development, given the fact that microcalcifications are an indication of malignancy. We should note that among the transplanted adipocytes into the breast, there are also some primary cells, the so-called stem cells. Nowadays these cells are considered to be safe. However, in the years to follow, the scientific community may give an answer to the question if the stem cells included in the transplanted fat have an oncogenic activity against the breast cells. Then we will able to examine the safety of this procedure. This is the reason why a special surgical team is required for the safe Fat Grafting, as well as a specialized team of radiologists and oncologists – mastologists, in order to ensure the early diagnosis of possible breast malignancy after breast Fat Grafting. How can we examine the breast of a woman, who underwent a breast Fat Grafting? After the breast size augmentation or correction with Fat Grafting treatment, the woman should examine her breast through both-handed palpation on a monthly basis. Regardless of having undergone a breast surgery or not, the woman should regularly examine her breast, as all women should too. After the surgery, the radiological examination should be repeated every 6 months and then every year, if everything looks normal. Soft tissues’ loosening and fall in the gluteus area is an anatomic problem affecting many women and men, as well. What we often observe when examining the gluteus area usually is a deficiency on the upper gluteus pole in conjunction with tissues displacement towards the lower pole. When combined with skin loosening, the area tends to look like a “deflated balloon”. Therefore, the solution we resort to is filling the atrophic buttocks up. Which cases are the most suitable for Fat Grafting to the buttocks? Improving the loosening and fall of the gluteus. Which women or men can undergo Fat Grafting to the buttocks? The basic requirement for the candidate to be subjected to Fat Grafting is to possess the required fat quantity so that we can extract the required fat amount for the transplantation. What kind of anesthesia is administered during the Fat Grafting to the buttocks? The Fat Grafting to the buttocks is a time-consuming procedure with several technical details that requires calmness from the side of the patient and meticulousness and maximum focus from the side of the doctor. On the one hand, we need to extract a large quantity of adipose tissue from the donor area (or areas) and on the other hand transfer said fat into many an area inside the gluteus. This is why the optimum type of anesthesia would be general anesthesia. What is the procedure followed during the Fat Grafting to the buttocks? As in every case of Fat Grafting, the gluteal augmentation procedure is also divided into 2 phases. Then, the extracted fat is centrifuged under aseptic conditions, so that a large number of stem cells and structural adipocytes can be isolated and collected. This fat is transferred into the RECEIVING area – i.e. inside the buttocks. From a technical point of view, which way is Fat Grafting to the buttocks performed? When performing Fat Grafting to the buttocks, we insert fat into several areas inside the gluteus. Superficially into the upper layer of the subcutaneous tissue of the gluteus. When performing fat grafting to the buttocks, we usually need 600cc to 900cc of fat for each gluteus. As already mentioned, 50-70% of the transferred fat gets absorbed and is hence lost, thus the operation’s net transplanted fat will finally be around 300-450cc per gluteus. In most cases fat grafting or buttocks contouring can be successful with a once-off treatment. On rare occasions a follow-up treatment might be needed, as long as there is enough fat to be transferred, of course. The fat grafting technique requires experience and technical skills during both extracting and transferring of the fat so that no large vessels and nerves are injured in the area of the buttocks. When performing Fat Grafting to the buttocks, can we also lift them? 1st. Transplanting fat in certain areas in the gluteus. We usually insert 130-250ml of pure fat in the upper outer quadrant so as to improve the curves and make the buttocks look more spherical, as well as 500-800 ml of pure fat into deeper gluteus areas so as to augment the size of it and make it project in a more aesthetic way. 2nd. Placing a special elastic film in the gluteus side, which pulls the area’s skin onwards and backwards settling it in a new, higher position. After the liposuction of the side gluteus area,the skin and adipose tissues have been detached from the more profound tissues. We can therefore lift the buttocks from 3 to 7 centimeters, due to the fact that the skin that has been detached during the liposuction is attracted by this special film and settles down in a new, 3-7cm higher position. The elastic films remain on this position for 4 more days for the skin to “stick” onto its new position and the result of the buttocks lift is permanent. What should we do RIGHT AFTER the Fat Grafting to the buttocks? Right after the operation, the patient wears an elastic corset so as to hold the buttocks into their new, lifted position and protect the operated area from possible swelling formation. It is a liposuction corset, especially designed in a way that permits all kinds of activity. The patient is allowed to leave the clinic and return home under some restrictions right after the operation when correcting small surfaces of local lipodystrophy (usually with local anesthesia combined with intoxication). However, in the case of small buttocks and several areas from which fat shall be extracted, the patient has to stay for 24hours in the clinic. What should one do for the days to follow after the Fat Grafting to the buttocks? The special films to lift the buttocks are removed in 4 days, whereas the corset must be worn by the patient for 15 consecutive days and, afterwards, for another month while taken out only during the night. Post surgically, swelling might be formed in the area where we have operated extracting the excess fat, as well as in the area to which we have transplanted it. This might be persistent for a couple of weeks. This swelling after the surgery is solely based on lymphatic obstruction because of lymphatic vessels micro-traumas of the area and gradually recedes by the automatic restoration of said lymphatic vessels within a few weeks after the operation. In order to accelerate the swelling’s healing, as well as to achieve an as homogenous as possible image of the skin and adipose tissue, we strongly recommend applying the LASER SMOOTHSHAPES. This is a Laser which has been designed to treat the cellulite while being very beneficial after a Liposculpture treatment, as well. This is because it quickly removes lymphedema, smoothens the treatment area and improves the cellulite (which more often than not co-exists with local lipodystrophy) state to a great extent. Usually, two sessions per week are required for about 3-4 weeks. The treatment is applied both to the gluteus and to the donor areas. Alternatively, we could apply lymphatic massage 2-3 times per week for about 3-5 weeks for the swelling’s treatment. Both the Laser Smoothshapes and often lymphatic massaging make the cure after Liposculpting and Fat drafting to the buttocks impressively fast. How will the buttocks area and the donor areas look like after the Fat Grafting to the buttocks? Might there be any pain? When intervening with local anesthesia or intoxication so as to correct small surfaces of local lipodystrophy, then the treatment area usually feels numb or esthesiodermia and a mild swelling. Seldom does it hurt or annoy. It doesn’t even need painkillers most of the time. Due to the fact that during Fat Grafting to the buttocks we intervene in several body areas so as to extract transplant-fat (Full Body Liposculpture), we usually experience a mild swelling as well as bruises post surgically on the donor areas. The swelling and bruises gradually recede (relatively fast) within about 7-10 days. There also is swelling in the area of the buttocks which recedes in about one and a half to two months, as buttocks gradually finalize in shape.With regards to the pain, due to the fact that during transplantation we intervene to several areas and in fact perform a radical body reshaping, there might be a mild nuisance or even a mild pain for the first one or two days, which can be though completely alleviated with painkillers. The nuisance or pain completely recede after day 3-5, hence it’s time to stop the intake of painkillers and the only thing that the patient might fell is a little numbness or esthesiodermia that might last about 3-6weeks. We should always bear in mind that even right after the surgery, the patient does not feel any pain at all – only feels numbness or esthesiodermia. However, when in motion, the patient might experience nuisance or mild pain, which can be totally alleviated with common painkillers. Might there be any side-effects or implications after a Fat Grafting to the buttocks? Fat Grafting in order to increase or reshape the contouring of the buttocks is a safe technique when performed in an organized surgical environment, by certified Plastic Surgeons and under the fundamental principles of Plastic Surgery. The most frequent case after Fat Grafting to the buttocks is bruises and swelling, which both gradually recede within 2-3 weeks. Furthermore, there might also appear post surgically some numbness or hyposensitivity in the area of liposculpture, which gradually recedes and is totally restored in the next few weeks. After liposuction for fat extraction, seroma might be formed. This is a collection of fluid that builds up in the DONOR area as a result of lymphatic obstruction. The fluid collection might last about 2-3 weeks and consists an adverse event rather than an implication. It is simply treated by discharging the lymphatic fluid. Skin traumas are in general not frequent and is treated with local care. After a Fat Grafting, it is pretty rare that inflammation or hematoma be formed, which can be immediately treated by discharging the fluid and antibiotics administration respectively. Another possible implication usually after several weeks or even months from Fat Grafting to the buttocks is the formation of small cysts with oily content inside the gluteus mass. These oily cysts appear because of fat melting and their usual treatment simply is puncture at the clinic’s premises. 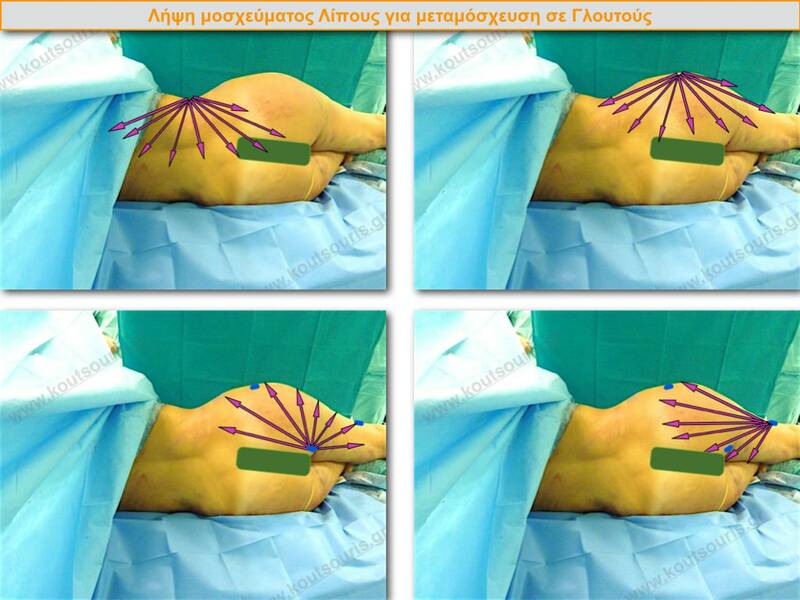 Due to the absorption of a part of the transferred fat by the organism, another problem that might arise after the Fat Grafting to the buttocks might be some mild asymmetries in the area. In such case, we usually amend the issue after 5-6 months, more often than not with local anesthesia. All along the surgery of Fat Grafting to the buttocks, the surgeon must be transplanting fat to anatomically safe areas in the gluteus. Given that the area is being supplied by large vessels and neurons, one should avoid injuring these vital organs. In case of injury of those large vessel branches, a pulmonary fat embolism is very likely or lower limbs nerve palsy. Those are two very serious implications which thankfully are pretty rare. Human atrophies and tissue deficiencies’ restoration with the use of fat extracted from an area of the torso and transplanted to another, is a contemporary and highly effective surgical treatment. Nonetheless, as happens with every new technique, it has some advantages and some drawbacks. What are the advantages of Fat Grafting? Fat is a very sensitive tissue and the graftingtreatment requires vast experience and meticulousness from the Plastic Surgeon. The transplanted fat is structural, thus abiding by the reserve fat rules. 2-3 months after settling down to its application position (given that it is not absorbable any more) it gives a PERMANENT or LONG-LASTING solution to the problem of tissue increase. The above properties make Autologous Fat a high-quality implant for the human body’s atrophies or deficiencies correction. This is the reason why those last few years there has been much talk in the scientific and research community on the fat extraction, transfer and infusion. What are the drawbacks of Fat Grafting? Fat Grafting for the human body’s atrophies or deficiencies correction through increasing the structural tissue, has some details that make it a NON FULLY PREDICTABLE treatment with certain drawbacks. Due to the fact that a 50-70% of the transplanted fat is absorbed, we should transplant double or triple fat quantity so as to attain the desirable rise in volume. This has as a result the formation of a swelling in the area which is gradually absorbed within 1-3 months. The creation of such swelling requires longer cure time and usually creates an unsightly image, giving the treatment away. There is no antidote – therefore if extracting some fat is needed, this can only be done by a new operation. This means that if after the swelling absorption there is excess fat in the transplantation area which causes an anomaly or deformity, then the patient must be subjected anew to an excess transplanted fat removal treatment either surgically or performing liposuction once more. Because the transplanted fat is structural fat, any fluctuation of it through the years shall reflect in the transplantation area. If for instance we have transplanted fat to the lips, then if the person gains weights (e.g. 15 kilos), the lips will also be inflated to a certain extent, as part of this extra fat will also be stored on those. This phenomenon might happen no matter how many years go by after the original Fat Grafting. During Fat Grafting to the breast, there might be formed small fat cysts after the surgery due to fat melting, which require diagnosis and surgical solution – usually diagnostic puncture. When transplanting fat to the breast, during the operation the gland is traumatized. Consequently, both the clinical and mammographic image of the mammary gland are distorted as years go by. Usually, after years, calcifications are formed in the mammary gland and differential diagnosis is required to prevent a malignancy formation in the breast. When performing Fat Grafting to the breast, among the transplanted adipocytes there are some primary cells, the so-called stem cells, which we nowadays consider safe cells. However, scientists are yet to determine if stem cells contained into the transplanted fat are potentially oncogenic or not against the breast’s cells. Thus, a special surgeons team is crucial in order to perform the Fat Grafting into safe areas inside the breast. On top of this, a specialized team of radiologists and oncologists is required so as to ensure a timely diagnosis in case of potential malignancy in the breast that has been subjected to liposculpture.